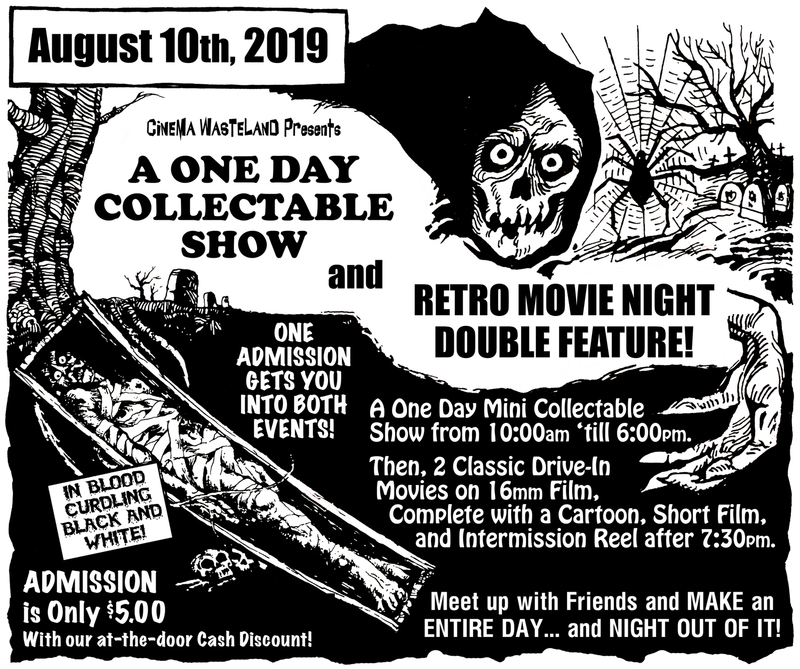 A ONE DAY COLLECTABLE SHOW and RETRO MOVIE NIGHT DOUBLE FEATURE! It’s a One Day Collectable Show featuring approximately 35 tables of Movie Collectibles, DVD and Blu-ray, Movie Posters, Autographs, and More from 10:00am until 6:00pm. Then, catch Two Classic (or not-so-classic, as the case may be) Drive-In Movies on 16mm Film. Complete with a Cartoon, Short Film and Original Intermission Reel beginning at 7:30pm. Make an Entire Day and night out of it! Come in during the day to hang out with friends. Grab a bite to eat and a couple of drinks at the hotel bar. Do some shopping during the day and return in the evening to watch the films. Your Admission gets you into both events all day and night! 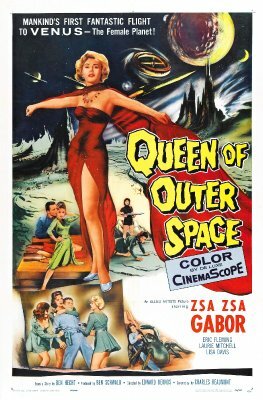 QUEEN OF OUTER SPACE (1958) En route to a space station orbiting Earth, a spaceship and the four crew members are attacked. When they awaken, they find out that they crash landed on Venus, a planet thought to be uninhabitable. Fortunately, the planet is inhabited - by beautiful women too. Unfortunately, the masked Queen, Yilana, (Laurie Mitchell) not only imprisoned our heroes, but took control of Venus and has plans to destroy the Earth with a beta disintegrator. All is not lost though. The beautiful Talleah (Zsa Zsa Gabor) is sowing the seeds of descent among the women of Venus and plans a revolt. This wonderful slice of vintage sci-fi silliness was directed by Ed Bernds, who helmed several Three Stooges shorts, a couple of Stooges feature films, and the live action segments for the 1965 Three Stooges cartoon series. This film certainly wasn’t intended as a comedy, but yes, you will find it extremely amusing along the way. 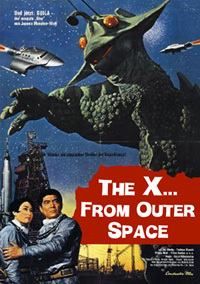 THE X FROM OUTER SPACE (1967) Spaceship AAB-Gamma is sent from Japan to make a landing on Mars and investigate reports of UFOs in the area. As they near their destination, they encounter a mysterious UFO that coats their ship’s hull with spores. Naturally, it’s always the best idea to grab a sample and bring it back home to Earth with you… so they do. And, well, it grows. Naturally it grows. Into a giant bug-eyed-chicken-looking-lizard-alien-monster thing-creature called Guilala. This is a man in a rubber monster suit trampling Japan monster movie after all. But hey, at least having a giant monster show up put an end to the fact that mankind’s advance into deep space seems to just be all about cocktail parties and lame jokes. And giant monster Guilala can not just smash some of the worst looking models in Japanese cinema history, but it can turn into a giant ball of fire and do cannonballs into lakes too. So there! Suddenly, I’m eight years old again and life is good. Plus, catchy theme song AND “what I learned from the monster” speech at the end. * This is the same Holiday Inn we hold out Cinema Wasteland Movie and Memorabilia Expo’s in twice a year. We’re just taking over one large room for this event and not the entire hotel. Admission is $7.00 if using a debit or credit card, BUT Only $5.00 Cash. There will be no advance ticket or pass sales for this event so we are offering a cash discount at the door instead. Tables are nice and affordable so hopefully by the time you read this there is still a table or two available.